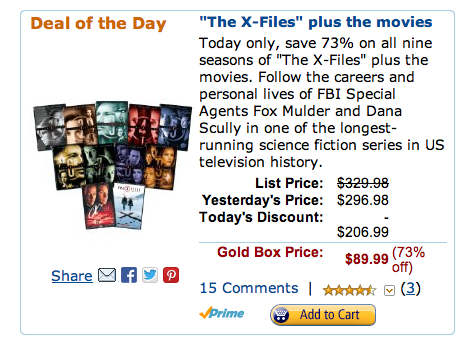 As their Gold Box deal of the day, Amazon is offering The X-Files: The complete series and movies on DVD for $90 with free shipping. As a pricing comparison, it retails for $330. This collection was originally released in May of this year. Deal ends tonight at midnight Pacific. Follow the careers and personal lives of FBI Special Agents Fox Mulder and Dana Scully in one of the longest-running science fiction series in US television history.